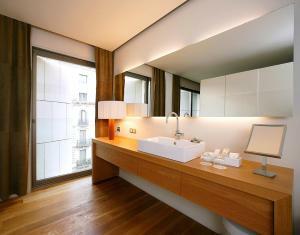 Hotel Omm in Barcelona offers stylish accommodation on Passeig de Gràcia, 5 minutes’ walk from Gaudí’s La Pedrera. It features a rooftop swimming pool and a terrace offering excellent views of Barcelona. Each of the Omm’s rooms has chic, contemporary décor. Rooms overlook Passeig de Gràcia, or the hotel’s interior garden. Each has satellite TV, free Wi-Fi and a large bathroom. The Omm‘s spa, Spaciomm, features steam baths, a fitness room and offers a selection of treatments including body and facial treatments, massages, and other treatments from around the world. The Lobby Restaurant & Bar offers an innovative selection of street food and dishes to share. Live music and Omm Club complete the leisure offer at Omm. Due to the nature of the non-refundable rates, the hotel highly recommends you contract travel insurance to avoid any penalty in the event you need to cancel this type of reservation. Guests are required to show a photo identification and credit card upon check-in. Please note that all Special Requests are subject to availability and additional charges may apply. Spacious and bright, this room features elements created by using natural materials such as parquet flooring and hand-woven rugs. The room comes with a large double bed or 2 single beds and views over the inner courtyard or over Paseo de Gracia Boulevard. The elegant bathroom includes a bathrobe, slippers and a hairdryer. There is free WiFi available throughout, and a private parking is available at an extra cost. Rate: € 205.70 ... € 1256.66; select dates below to get current rates. This more spacious, stylish room is designed with warm materials such as natural oak parquet flooring and hand-woven rugs. Offering views of the hotel’s inner courtyard or Passeig de Gracia Boulevard. This room comes with a large double bed or 2 single beds, subject to availability. The elegant bathroom includes a hairdryer, bathrobes and slippers. There is free WiFi available throughout, and a private parking is available at an extra cost. This spacious, stylish junior suite features a canopy bed and a seating area. Overlooking the hotel’s interior garden or Passeig de Gracia Boulevard. It is decorated with natural tones and parquet floors. It offers flat-screen satellite TV and a minibar, while the elegant bathroom includes a hairdryer, toiletries, bathrobes and slippers. This spacious, stylish suite overlooks the peaceful interior garden, and has plenty of natural light. Decorated with natural tones and parquet floors, it features a four-poster bed, a seating area with a large sofa and a walk-in wardrobe. It offers flat-screen satellite TV and a minibar, while the elegant oversized bathroom includes a hairdryer, toiletries, bathrobes and slippers. Free parking space is included with this room type. This family room consists of interconnecting rooms, 1 Junior Suite and 1 Interior Twin Room. Please note that the interior twin room has no natural light. 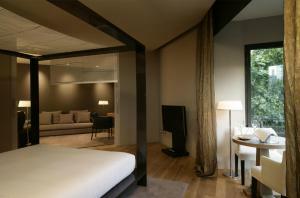 Decorated in natural tones with parquet floors, all rooms feature flat-screen satellite TV and a minibar. The elegant bathrooms include a hairdryer, toiletries, bathrobes and slippers. 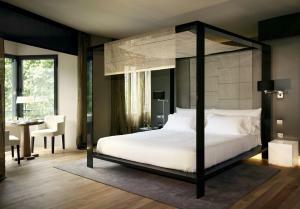 The Junior Suite also has a four-poster bed, a seating area and views of the interior garden. 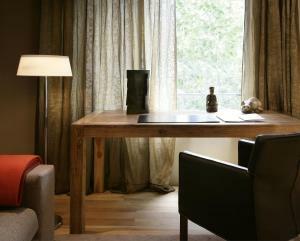 Spacious suite with separate lounge area containing a large sofa and work desk, all created in warm natural materials. Enjoy your breakfast while looking out over Paseo de Gracia. This quieter room comes with a satellite TV, a free safe and a private bathroom with a bathrobe and slippers. There is free WiFi available throughout, and a private parking is available at an extra cost. 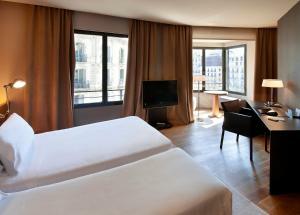 These twin/double rooms features a balcony overlooking either Passeig de Gràcia or the interior garden. These twin/double rooms overlooking Passeig de Gràcia or the interior garden and is decorated with wooden details and local art. It features a large bathroom and some rooms have a private balcony. This bright Junior Suite features a lounge and reading nook with views of Passeig de Gràcia or the interior garden. This bright suite features a rain shower and views of the interior garden. This suite features a small reading nook overlooking Passeig de Gràcia. This family room features two large rooms with private bathrooms, both overlooking the interior garden.